J & W Service Inc. Welcome to J & W Service, Inc. We have been providing heating and air conditioning products and services to individuals, non-profit organizations and small corporations in the Whitsett, Gibsonville, Elon, McLeansville, Burlington, Greensboro and surrounding area for over 29 years. Count on J & W Service, Inc. when quality really counts. Remember, exceptional service is our standard. Jerry Small started J & W Service in 1986 as a sole proprietor. Jerry, along with his wife Wanda (for 33 years) have worked hard to establish their family business and they take much pride in servicing the local community. After 10 years of hard work, they decided to incorporate the business and become J & W Service, Inc. and the two of them are the primary officers of the company. Jerry is the president, while Wanda holds the vice president position. Jerry comes not only from hard work and lots of experience but with a solid list of credentials. He worked his early teenage years with his grandfather and uncle in the heating and air conditioning business. He later worked for a large commerical heating, air conditioning and fabrication company that worked in many of the North Carolina mills. Jerry went on to attend Alamance Community College and earned his certifications in Heating, Air Conditioning and Ventilation and also those of a General Contractor and Supplemental Electrical. Jerry has his credentials to handle refrigerants. He has also built several homes, including his own personal home. Jerry continues to attend training classes for continuing education purposes, as well as personal growth and knowledge as equipment changes. 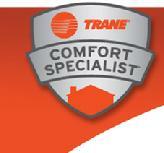 Jerry specializes in Trane products, but is capable of servicing other equipment products. Jerry and Wanda are both very active in the community. They are members of Gibsonville Merchants Association and have both held offices in that organization. They both donate their time to help organize events such as the Fall Festival, Saturday's at Seven, and Lighting of the Green in Gibsonville. They are both members of Springwood Presbyterian Church and volunteer with activities with Boy Scouts, Troop 265. They have two sons, Jerry and Jeffrey and one granddaughter, Lilly-Claire. Jerry and Wanda's oldest son, Jerry Small II, grew up learning the business and often helped his Dad and Mom. Even as a toddler, Jerry II spent time in the office and as he grew older worked in the sheet metal shop. He eventually started going on jobs with his Dad. Jerry earned his Eagle Scout, while in high school. After graduating from high school and the Heating and Air program at Weaver Education Center in Greensboro, Jerry II followed in his Dad's footsteps and attended Alamance Community College while working part-time in the business. Jerry II earned his Associate's Degree in Heating, Air Conditioning and Ventilation. He has continued his education and training and is NATE certified and has his credentials to handle refrigerants. He joined J&W Service, Inc. fulltime in 2011. Jerry II works hard as a father to his daughter Lilly and volunteers his time to coach for Gibsonville Parks and Recreation.